Social Housing properties are required to have efficient heating and effective insulation. A fireplace is an excellent source of heat as well as a key selling point, making it a popular option for social landlords. Many properties, especially older ones, may already have a pre-existing fireplace or back boiler system which requires maintenance or review. It may seem a cheaper option to remove the fire and plaster the wall rather than install a new fireplace, however this can become a rather time consuming project and costs to ‘make good’can quickly escalate. To address these issues, and keep costs down, Be Modern have developed a range of complete electric fireplaces specifically designed for social housing that provide a clean, efficient and cost effective alternative. We always recommend that old gas fires and back boilers are removed by a registered Gas fitter and that the remaining hole is blocked up and plastered. Our electric fireplaces are delivered as complete one box products, including the fire, which can then be fitted directly onto the wall, covering any previous marks. Then simply plug in and play. In comparison to a traditional gas fire, electric is highly efficient at the point of use; thermostatic controls allow easy use and the option of a realistic flame effect only setting without the heat output ensures tenants can still enjoy the ambience of a fire during warmer months. 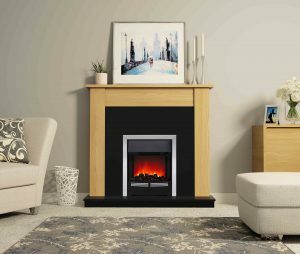 Available in a range of finishes, an electric fireplace can provide an aesthetically pleasing centrepiece for the living room and provide an instant source of secondary heat for the living area. Installing a complete electric fireplace can save valuable time and money. Our oversized hearth options can easily cover previous carpet cut outs too. Unlike gas fires, Be Modern electric fireplaces do not require yearly maintenance and servicing, allowing for further annual cost savings.